Shortlisted for the William Hill Sports Book of the Year Award 2017. 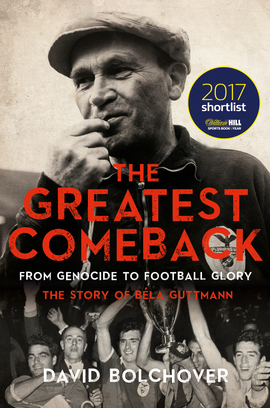 Longlisted for the Coutts Football Writers Association Award 2018. History and memoir offer insights into other times and lives that make Britain’s current miserable travails marginally more tolerable. The Greatest Comeback by David Bolchover is astonishing, not least for its unlikely melding of football and mass murder, two of my daily passions. "...sensitively and lovingly drawn. A remarkable life has the thoughtful, passionate biography it has long deserved."